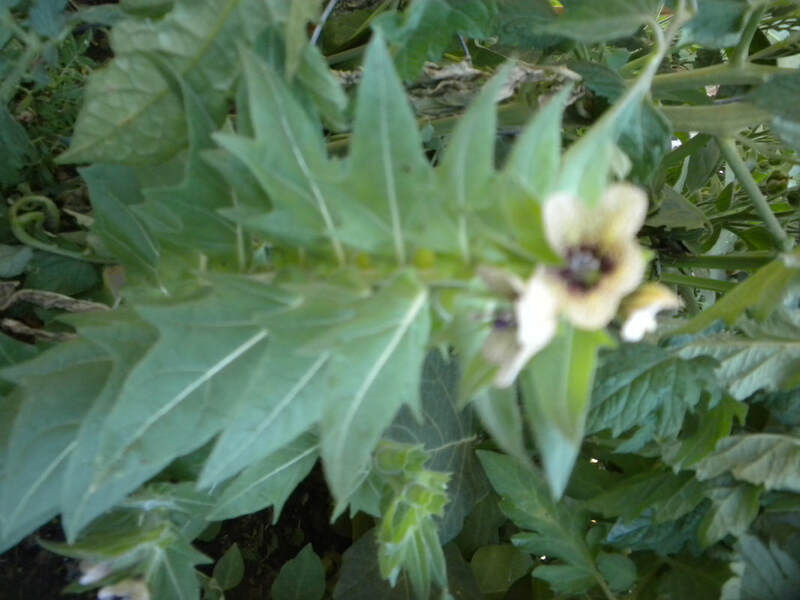 Henbane - White Buffalo Trading Co.
Hyoscyamus niger is an annual or biennial herb growing up to one yard high that produces veined yellow flowers and large quantities of seeds. The flowers grow one after the other on single stalks arching upwards. All parts of the plant, including the seeds, contain scopolamine, atropine, and hyoscyamine, and like many Nightshades, can be medicinal, hallucinogenic, as well as deadly poisonous. Henbane, also known as stinking nightshade or black henbane, is a plant of the family Solanaceae that originated in Eurasia; now globally distributed. Black henbane can be directly sown in the garden after the last frost. It can also be started in 4-inch pots and then transplanted to the garden. Water daily until established. Mature plants need only weekly watering. Full sun. Well-drained soil. Native Origin: Europe and Asia; now into North America. Favorite Habitat: Sunny meadow with loam soil or woody edge-lands. Soil Requirements: Prefers nitrogen-rich, moist, well-drained soil. Soil mix: Composted manure/peat moss/sand/ perlite mix. Water: Weekly watering. Not drought tolerant. Fertilization: General fertilizer when flowering. Planting Time: Spring through summer, after last frost. Spacing: Six inches to one foot. Seed Germination time: 3-15 days. Seed Germination Methods: Flats: plant seeds 1mm deep under peat moss and perlite. Harvest: Matures at 90 days. Harvest leaves in Summer or Fall after flowering. Bloom time: Summer to fall. USDA Temperature Zones: Grows all over the continental USA as an annual. The name henbane dates at least to A.D. 1265. The botanist Linnaeus gave this plant its Latin name in the 1753, basing it on its former name of "dioskyamos," or God's bean. The henne origin of henbane refers to death and is tied to the name of the German god, Henne. Henne bean. Bean of death. In Greek mythology, the dead who wander the shores of the River Styx are crowned with henbane. The Oracle of Delphi was said to breathe in the smoke in order to divine the future. 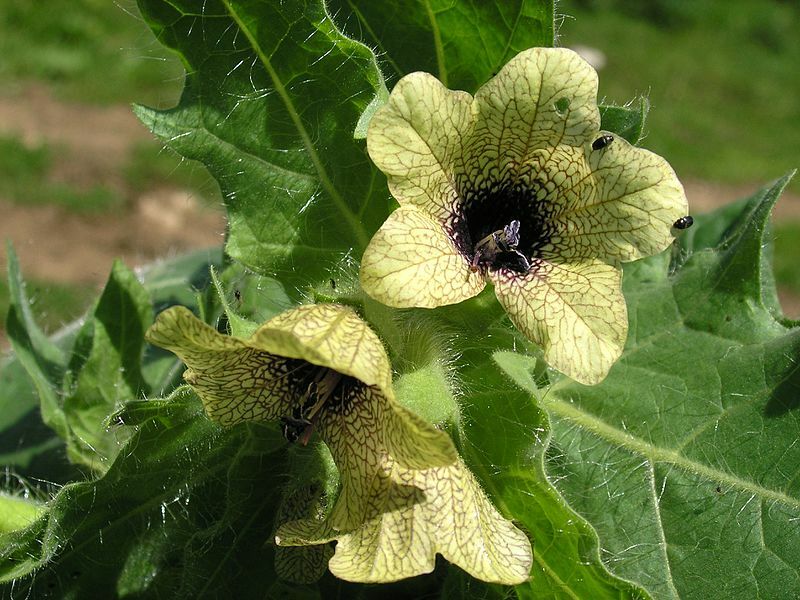 Henbane was used ritually in ancient Scotland. Henbane is associated with beer in the Alps, where it still carries the name Bilsenkraut, or beer lettuce. In that locale, a goddess name Bil is also known as the Fairy of Henbane. In the Middle Ages, Agrippa recognized henbane's connection to the dead by including it in an incense designed to raise spirits. This magick herb is still used to consecrate ritual vessels and is an ingredient in incense for bringing rain. Henbane is still an ingredient in incense burned as a part of shape-shifting work. Like Datura and other members of the Nightshade family, Henbane contains atropine. While toxic, check out the movie "The Rock" about terrorists with deadly nerve gas. The nerve gas antidote is pure atropine, injected into the heart of the victim to save his life. Atropine has medicinal value, and: it can also kill you.